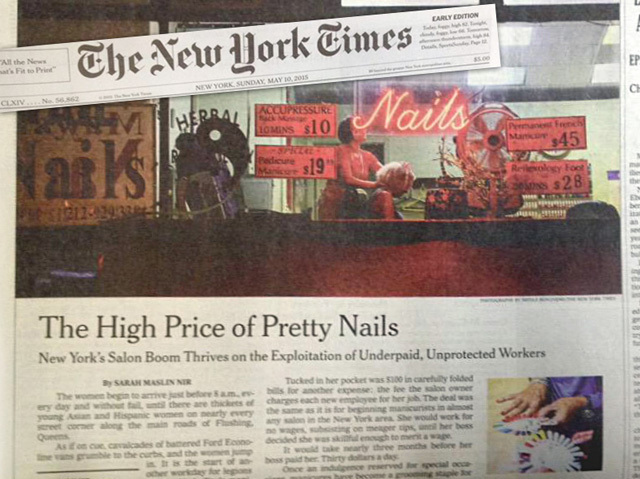 NAILS Magazine and VietSALON Magazine applaud the New York Times exposé of the appalling exploitation of nail salon workers in certain communities and urge increased consumer awareness and enforcement efforts. The recent New York Times story about exploitative practices in some New York area nail salons was deeply disturbing. The conditions outlined and the treatment of people described in the article are an affront not only to every rule-following, employee-respecting salon owner, but to anyone with a working heart. While the problem may be limited to a particular part of the country, it shines a light on a problem that occurs in many industries: Consumers grow to expect cheap goods and services and don’t think about the real cost, which is low wages, no benefits, and substandard working conditions. And greedy business owners pull the maximum profit out of their businesses, even if it means treating their workers unconscionably. The number of services some of the salons cited in the articles was alarming. One nail technicians said she did upwards of 30 sets of acrylic nails a day. Even working at a pace of the fastest and most experienced nail technicians, that would mean a 15-hour work day, and that is wrong. Most licensed professional nail technicians and salon owners would love nothing more than to see the ouster of these exploitative owners. They hurt fellow nail technicians, they bring shame to a vibrant industry that puts $8.5 billion into the U.S. economy and employs several hundred thousand workers, and they cause the public to question our entire industry. As a trade magazine dedicated to the professional nail industry, we applaud Governor Cuomo’s quick action, though we take some issue with the specifics of it. We believe there are ways to rectify the issue by simply enforcing laws already on the books. We’re happy that The New York Times researched the topic so deeply and thoroughly. The article will surely help the consumer make smarter and more conscious choices when deciding where to get her nails done. All nail technicians should be trained and licensed; it’s the law in nearly every state. Yet every few years, states will take their vocational boards under review to determine whether they are still “relevant” (what is called sunsetting). It’s usually around this time that you’ll hear some state senator mockingly ask why people need a license to paint fingernails! Yet the problem with the state regulations is not whether the industries need a licensing board, it’s that there needs to be increased oversight on industry practices and, obviously, much greater enforcement. We studied the ratio of state board inspectors to the number of salons a few years ago and singled out several states for praise that had a low ratio and that had de-incentivizing fines. But in many states, salons won’t see an inspector for years, and even when they are cited, the fines are so small, they’re merely a nuisance instead of a deterrent. The best way to effect change is first for consumers to vote with their pocketbooks. Just as many consumers have resisted the lure of bargain retailers when the true story of how they treated their workers came to the surface, it’s just as important not to support establishments that are exploiting their workers. Sadly, many of those workers, who never should have been working in a salon in the first place, will lose what meager wages they currently earn. But no wage is worth being treated the way these workers were. We want our readers to remember to focus on the good things that consumers can do to put an end to abuse. > Are the nail technicians licensed? If there is any hesitation at all to showing a client a license (which is supposed to be displayed in plain view), turn on your heels and leave. > Is the salon clean? A nail technician should start every service with a clean set of tools, a clean towel, and a clean workstation. If you can see fingernail clippings on the table and the tools are soaking in a sludgy jar, find your way to the door. > Low prices are not necessarily an indicator of a low quality salon. A $10 manicure is usually just a basic affair, and often a salon’s “loss leader.” But just as you do with waiters, cab drivers, and others you know rely on tips, it’s customary to tip a manicurist 18%-20% or higher if the service is special. > English is not an element of whether a salon is good or not. Plenty of very talented and experienced nail technicians speak minimal English, but you should be able to have your questions answered satisfactorily by the salon owner or a nail technician. > Protective gear such as gloves or masks are not an indication that dangerous products are being used. It’s smart practice for nail technicians to use protective gear. > A small amount of odor is to be expected during certain services, but an overpowering odor is a sign of poor ventilation and may indicate a lack of concern about workers’ health. We are all in this together: We're in the professional nail industry, we are working women (mostly), and we're caring people who believe that all workers should be treated fairly. I'll be sharing more thoughts on second part of the NYT story about salon workers' health issues.